In 1923 plans were filed with the New York City Dept. 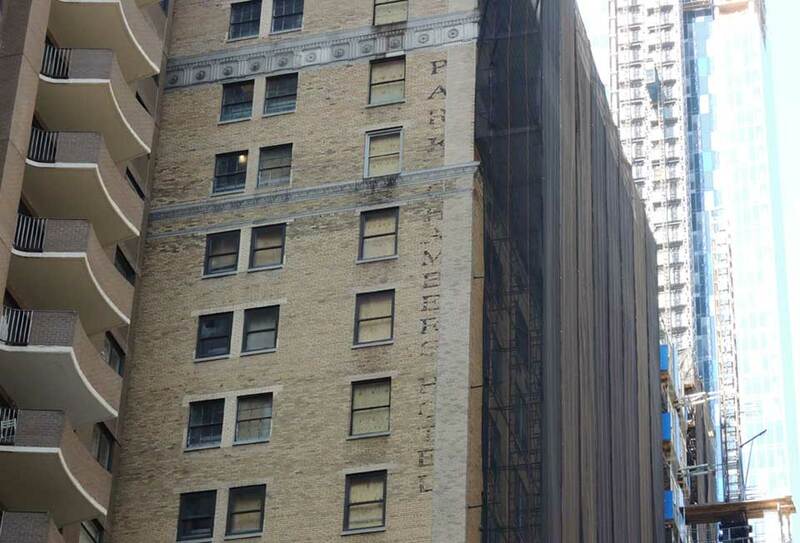 of Buildings for a 17-story fire proof hotel at 1024-1028 6th Ave. The owner was N. Christatos, and the architect was Rouse & Goldstone (www.metrohistory.com). This became the Park Chambers Hotel, in business at this location from 1923 to 1965. A New York Times article, 4 Nov. 1965, described the conversion of the building to an office building: "The conversion of the 19-story Park Chambers Hotel to an office building will include an air-conditioning system cooled by air rather than water... The conversion of the hotel, begun last month, will produce 110,000 feet of office space. The structure will be known as 1414 Avenue of the Americas." The transition of 1024 6th Avenue to 1414 Avenue of the Americas came about as a consequence of the renumbering of buildings on 6th Avenue when it was extended south from its original termination near Bleecker St. in the 1930s. To add to the confusion there was an attempt (1960s?) to rename 6th Avenue to the clumsy form Avenue of the Americas. Few New Yorkers have ever accepted the name change. The original owner of the Park Chambers was Nicholas Christatos (1853?-1941), an immigrant from Greece, who was listed as a florist at this same corner of 6th Ave. and 58th Street beginning 1896. His obituary in the New York Times, 4 Sept. 1941, read, "Nicholas Christatos, retired florist who owned the Park Chambers Hotel on the southeast corner of Fifty-eighth Street and Sixth Avenue, died Monday at his home in West End, N. J., at the age of 88. Born in Greece, Mr. Christatos spent several of his youthful years as a sailor, finally leaving the sea to try his luck with flowers in New York. He had owned shops in other parts of the city before establishing himself in 1897 at the southeast corner of Fifty-eighth Street and Sixth Avenue, where he remained for twenty-six years, until his retirement as a florist in 1923. Mr. Christatos leaves a widow, Christina, and a son, Constantine Christatos, who operates the Park Chambers Hotel." Constantine Christatos (1898-1986), son of Nicholas Christatos, operated the hotel after his father's death. This ad for the Park Chambers Hotel is taken from Manhattan telephone directory for 1942. This one from 1945 is for the Cafe 68 in the hotel.